Growing up, most evenings we’d end up around Colaba Market. It was centrally located and many friends lived around there. Even today, when we go for a walk with Meera, we shop our way through the market enroute to Kailash Parbat for some chaat. 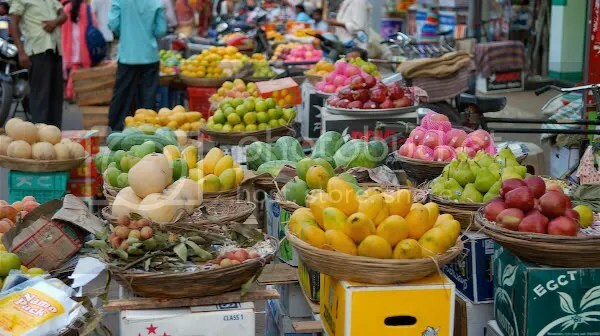 It is refreshing to see baskets of fresh fruits and vegetables on the road sides. The produce here is local, seasonal and helps local workers. Better carry a shopping bag. The best part – you only buy what you need for a day or two. Then come again. Cantaloupes are much smaller here than in Boston, but more delicious. Watermelons don’t win awards for size, but do for sweetness. Lychees appear dry, but are nectarine; best served chilled; @ Rs40/doz; Meera loves to peel them! Apples and pears – why bother what I routinely get in Boston? Kumta vegetables, hmmmm they so tasty we cannot compare them with veggies we get here in Mumbai, the Kumta veggies are so awesome. The Jeev kadgi oops they are sooooooooo yummy. When I had visited Kumta market, when I saw the veggies I felt like buying them all and bringing it at Mumbai. The vaali bhaji (maayalu bhaji), I really cant describe what i feel when I see the fresh veggies available in Kumta market. Its a great feeling. When in Kumta, I wish I could bring them home and someone could transform them further into delicious dishes. OMG!! How beautiful and colorful. All we survive here are Cabbages and Potatoes..well.. most of the time anyway, unless we visit Indian store which is not often. I envy you guys there. A very happy Father’s day to you in advance Arun. I will be on blog break from 18th and planning for vacation too since both kids are home, so I might not be able to wish you next week. Have a wonderful dad’s day. Thank you for your beautiful wishes and kind words. Have a wonderful time with the kids on vacation. have a great trip and see you when you are back. 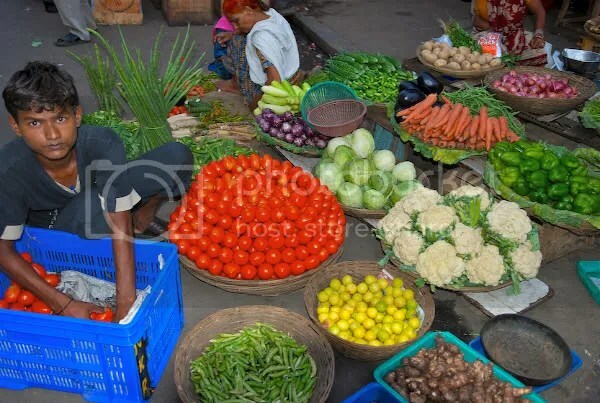 Arun – It feels so good to see these fresh vegetables. While we get an array of fruits and vegetables here in the US, there is nothing that matches in taste to the ones we get in India. The best part as you say is we can buy them fresh everyday and need not pile them in our regrigerators. Every time I visit India, I may hesitate to go to a mall, but never to a vegetable market. Ha ha! exactly. I may not stop by the mall, but the vege market is such a thrill to always visit. this one is so close to our home that we go by there nearly every day. It is also such a joy to try different seasonal fruits every day. Gosh, Arun you are always in India…so envious. Love this post. this sums up my memories of growing up till a teenager in Mumbai. The colors of the fruit and vegetables are so vibrant and diverse. I love going to farmers market here. In India everyday is a farmers market (kinda..even though the farmers are not selling their produce). I’d rather buy it from them than a supermarket chain…Eat while in season is a motto I am trying to live by. No summer peaches in winter for me. Buy local and seasonal fruits and veggies is what I try to do. Reduces my carbon foot print and this year I am trying to grow an array of indian veggies from bindi (okra), eggplant, cilantro, meethi (fenugreek greens) to heirloom tomatoes. have a wonderful trip. Good to hear from you and awesome to hear that you are growing a large array of beautiful veggies – such fun! (though a lot of hard work too). If we stick to buying from the local shops and farmers, we end up eating seasonal things. That is good, not only from acarbon footprint perspective, but apparently provides the necessary variation for our body and keeps it in synch with the surrounding flora. Hope your studies are going well – do send an update sometime. With best Wishes and thanks for your enthusiastic comment. I like variation, if it’s not big trouble to you…every time you post your nice pics, you do it differently…lol. But usually agree with Jessie who enjoys taking time on each pic while reading the subtitles. agree – this slideshow is not for all posts. Thank you Jessie – indeed, street artistry. Its such a pleasure to see them spend so much time arranging and re-arranging their wares. and I end up buying so much stuff from them. Thank you Poornima for sharing your comment. I think tomatoes are key to photographing any vegetable market. The bright, shiny reds add zest to the images. I agree, every time I go by the market, I end up buying different vegetables and once I get home, poor M wrings her hand as she has to now do something with them. Do you still work near there?